For more information on the book, visit AmongstTheLiberalElite.com. "Elly and Joan have performed a spectacular magic trick with this book–they’ve reached into our heads and pulled out our collective ids, in all their self-centered, inadequate, well-meaning, earnest, BPA-free glory, given them devastatingly accurate haircuts, and named them Alex and Michael. Alex and Michael are here to provoke, to question, to make you roll your eyes so deep in your head you see your brain stem–but also to chuckle in recognition, because really, we’ve all got at least a little Alex and Michael in us. 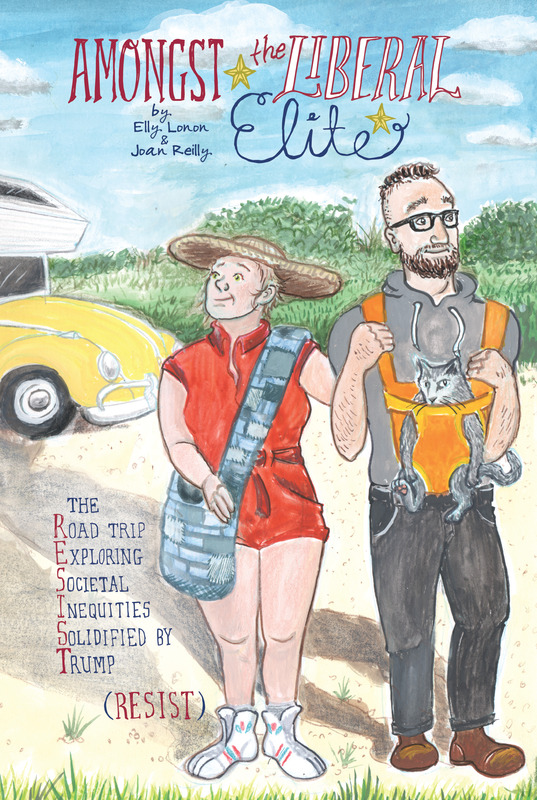 Elly and Joan’s sharply observed, witty, generous, self-mocking epic is a gift for anyone who’s ever taken a journey from the frying-pan of their own head to the oven of our burning world." "Amongst the Liberal Elite is the book everyone with outrage fatigue (and a sense of humor) needs." High-res scans to your specification are available upon request; scanning from the book or lifting images from the mechanical file are strictly prohibited. Mandatory credit line: From Amongst the Liberal Elite by Elly Lonon and art design by Joan Reilly, published by powerHouse Books.